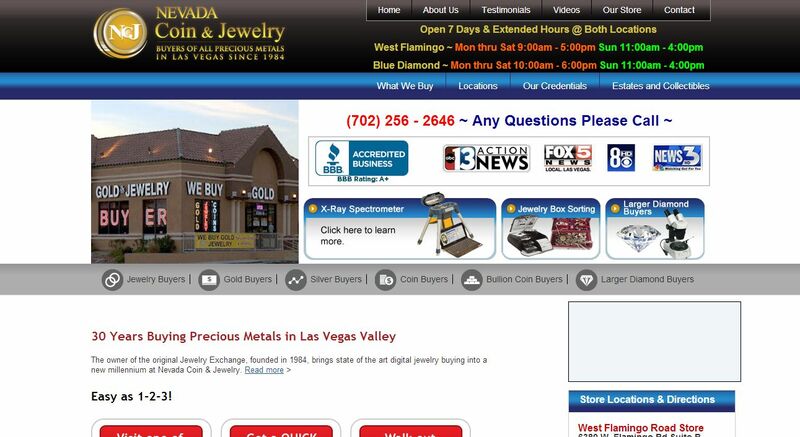 Nevada Coin & Jewelry address, phone, website, hours of operation, and more. Nevada Coin & Jewelry is one of Las Vegas and Henderson’s largest buyer of jewelry, gold, silver, sterling silver, platinum, coins, bullion, and larger diamonds. Since 1984, we have provided thousands of customers with accurate evaluations and delivered top cash for unwanted jewelry and coins. We also buy broken and scrap jewelry, dental gold, sterling silver flatware and accessories. In addition, we are GIA certified.